The conference will take place in the University of Balearic Islands campus. The conference room will be the "Son Lledó" building Auditorium, and coffee breaks and meals will be served nearby. The conference materials desk will be open from 8am in front of the conference room before the first session on Monday. Please click here for the location of the Son Lledó building on the UIB campus, or see "Campus" below. Transport from the city center to the UIB campus is made easier by the Metro line, departing from Plaça d'Espanya. Palma de Mallorca is very well connected with the rest of Spain and Europe (specially Germany, the UK, Austria, Switzerland and Scandinavia) with its international "Son Sant Joan" airport (airport code PMI), the only airport on the island of Mallorca. 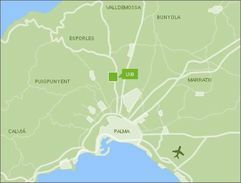 The airport lies 8 kilometers east of Palma. Bus: EMT Line 1 Bus, Harbour-Airport (The stop is outside the Arrivals Hall and, on average, there is one bus every 12-15 minutes). Ticket price: 2 EUR. For Hotel Palladium please get out at "Passeig Mallorca 38" and for Hotels Jaime III and Almudaina at "Passeig Mallorca 18". For "Palacio Avenida" and "Misión de San Miguel" and "Abelux" at Plaza Espanya. Line 21, departing also from the airport, does not go to Palma downtown, but rather to Arenal. Taxi: can be found also outside the Arrivals Hall. Average price to hotels: 20 EUR (with supplements for luggage, night time and Sundays). This is the recommended transportation between Palma downtown (Plaça de Espanya) and the UIB campus where the workshop will take place. Travel time to "UIB" (last station of the ride) is 13 min. There are four services per hour, at 0, 15, 30, and 45 minutes every hour from 8 a.m. until 8 p.m. Ticket price is 0.90 EUR. Please keep the ticket until the exit. A return ticket can also be purchased for 1.70 EUR. After arriving at the UIB Metro station, you can either walk or take thefree UIB shuttle (Bus circular), and get off at the first stop, "Son Lledó". The conference room is just opposite the bus stop. 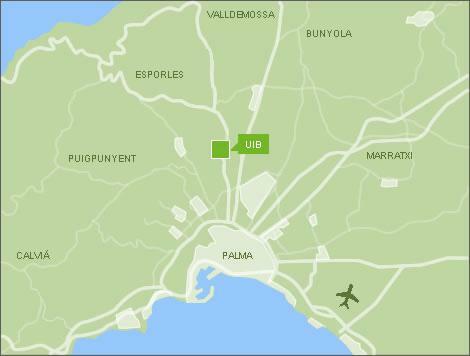 The UIB campus is located 7.5 km from Palma downtown, in the middle of a scenic landscape, and quite close to the mountains in the "Serra de Tramuntana" range. A map can be found here. A Google Map showing the location of the Son Lledó building, where the talks will take place, can be viewed here. Furthermore, a PDF of the UIB campus and the Son Lledó building can be found here. Mallorca has a Mediterranean climate. The average maximum and minimum temperatures in June are around 26 and 18 degrees Celsius, respectively. The average number of days in June with precipitation is about 4. For more information visit, e.g. Weather Online. The official time on the Balearic Islands is the same as the time on the Spanish mainland: During autumn-winter, GMT+1; During the spring-summer, GMT+2, following the Daylight Saving Time convention of the European Union. Here you can find information on the Tourist Information offices. The Balearics Islands search engine. The official web of the Palma de Mallorca Town Council. Mallorca Fact web page: All the information you need on Mallorca. The official tourism portal of the Balearic Islands. You can find all the information you need about the Balearic Islands. In this portal you can find all the maps you need. Official web of the Consell de Mallorca. A listing of the various bus lines.